One of the VSPCA's main goals is to reduce the number of stray and un-wanted dogs and cats in the country. 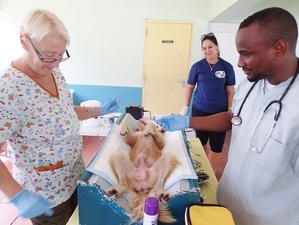 To this end, we organize and hold spay/neuter clinics in various communities on St.Vincent and whenever possible, on the other Grenadine islands. Our team usually consists of Dr.Eric Audain and assisting him with the surgeries, Carolyn and/or Traudl, and on some occasions medical students from TSOM. Beside the surgery team, we also try to get several volunteers to help out with setting and closing up, registration and paperwork for the surgeries,and just general running of the clinics. Our new van has made our job easier in that we can take all our necessary gear to the community, especially given that we do not have an office where we can store our equipment. Most of the funds we raise via various fundraising efforts go directly to pay for these clinics. These are held on a regular basis with the assistance of local community members, VSPCA volunteers and a veterinarian.